Earn $10.66 in VIP credit (1066 points)What's This? The Dura-Ace Di2 SM-EW90-A Junction connects the E-Tube wires from the electronic shifters to the rest of the 9070-series Di2 components. It also contains the battery indicator unit which can be engaged by the pads on shift controls. An LED indicator at the junction will display green if the battery is over 50% charged, red if under 50% charged, and flashing red if the battery is almost drained. The indicator mounts to the brake cable housing just below the stem and handlebar junction via an included rubber strap. 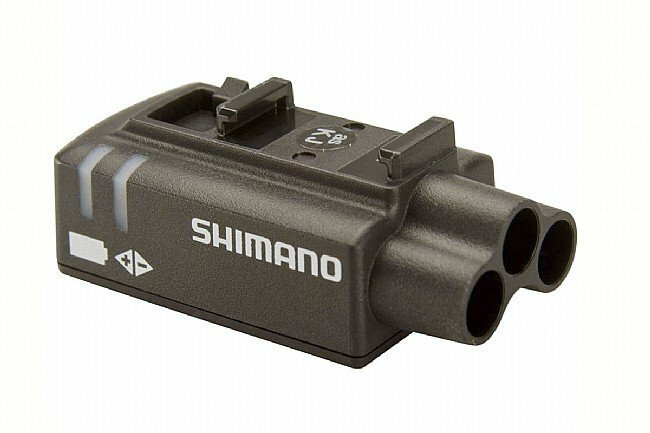 The SM-EW90-A Junction features a three port E-tube attachment for use with standard Dura-Ace Di2 ST-9070 Shifters. Wires are not included. The EW-SD50 (sold separately) rear wire is required to connect SM-EW67 Front Wire/Junction (Junction A) to the Rear Junction Box (Junction B; sold separately).